The CML Clinical Trials Registry is growing steadily. Our database continues to benefit from additional studies which makes this resource increasingly valuable to patients. Seven new studies have been entered since November 2014. The registry now lists a total of 24 CML studies at http://www.cmladvocates.net/cmltrials and we are continually adding further studies as they become known to us. Thanks very much to everyone who provided information on new studies or helped ensure that the registry entries are correct and remain up to date. eltrombopag for thrombocytopenia in CML. For other studies that were previously included in the registry, we have updated the list of participating study centers and added study information or relevant links. Recruitment has been completed in five studies, meaning that no further patients will be included. These studies have been moved to the new category “Trials that are no longer recruiting”. Do you know of any study that is not yet listed here? Please let us know by filling out this form. Or is there an entry which should be corrected? If so, please send us an email. Please also visit our discussion forum if you have any questions or wish to share your experience on these studies! Now 98 patient organisations from 74 countries in the CML Advocates Network! We are truly overwhelmed by the rapid growth of our network. Since January 2015, we have welcomed 8 new organizations from 5 countries! It´s so great to see the community growing at this pace! Today we want to welcome The National Cancer Control Foundation based in Yemen as our 98th member organisation. We now have members in 74 countries worldwide! See the list of CML groups in the Network on our world map. It is now available in 16 languages: English, Arabic, Bulgarian, Chinese (traditional and simplified), Dutch, French, German, Hebrew, Italian, Polish, Portuguese, Russian, Serbian, Spanish and Turkish (new: Serbian, thanks to Jelena from the CML Association of Serbia). The CML Advocates Network is growing fast. We hereby proudly welcome four new members to our network. These are: APSBES / DILIGENCE GROUP from Togo, LUZ DE ESPERANZA from Peru, BCSG from Bangladesh and Zero Club from South Korea. With this we have now reached the number of 96 organisations from 72 countries across all continents. How exciting! See the list of CML groups in the Network on our world map. We are delighted to welcome another new member to our network: the group "ASSOCIATION DE LUTTE CONTRE LES LEUCEMIES AU NIGER" is our first member organization based in Niger. WELCOME, NIGER! From today, the Network connects 92 organisations from 70 countries across all continents. See the list of CML groups in the Network on our world map. We are delighted to welcome two new members to our network: "Maxvida" from Chile and "Osmijeh Tuzla" from Bosnia and Herzegovina. "Maxvida" is the first Chilean member of the CML Advocates Network. With "Osmijeh Tuzla", there are now two member organizations based in Bosnia and Herzegovina. From today, the Network connects 91 organisations from 69 countries across all continents. See the list of CML groups in the Network on our world map. 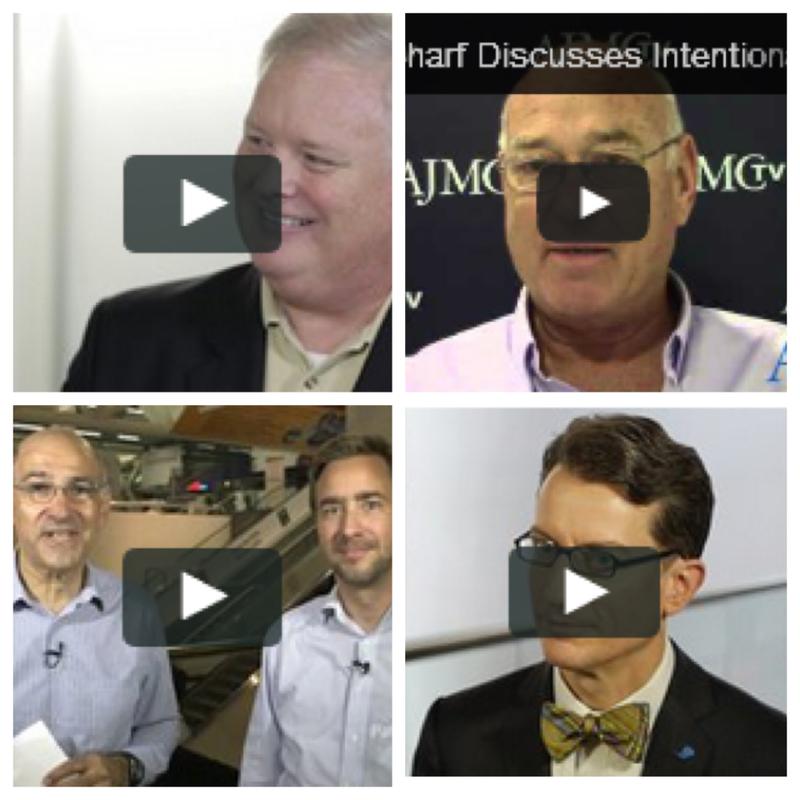 At the ASH Meeting in San Francisco, PatientPower, Brandcast Media, The National CML Society USA and the American Journal of Managed Care conducted interviews with Dr. Michael Mauro, Giora Sharf, Greg Stephens and Jan Geissler. See the the ASH 2014 interviews covering issues around newest CML trial data and quality of life issues, accessing CML treatment, patient advocacy, treatment adherence in CML, the book "Faces of Courage and Hope". It is now available in 15 languages: English, Arabic, Bulgarian, Chinese (traditional and simplified), Dutch, French, German, Hebrew, Italian, Polish, Portuguese, Russian, Spanish and Turkish (new: Turkish and Chinese). Register now for CML Horizons 2015, 1-3 May 2015, Barcelona, Spain! We are looking forward to the 13th CML Horizons conference, held in Barcelona / Spain on 1-3 May 2015. The CML Horizons Steering Committee has worked hard to ensure that the conference includes topics of importance to the CML patient community, and provides a unique opportunity for participants to share experiences and best practice. We hope that as a result of this meeting, CML patient groups globally will improve their capacity to meet the needs of their patients, and strengthen their advocacy activities. ASH 2014 Report #2: New data on Ponatinib – most potent, but overdosed? Ponatinib, the first 3rd generation Tyrosine Kinase Inhibitor and potentially one of the most potent CML drugs on the market, has gone through a roller coaster ride over the past two years. The patient community has been following the development of ponatinib since it the first data of a phase I study with the so-called AP24534, today called ponatinib/Iclusig, was presented at ASH 2009. Given it is the only drug effective against T315I and some other multi-resistant mutations, and seems to work very effectively in many patients even after failure of imatinib, dasatinib and nilotinib, the drug has deserved a lot of attention. Based on a rough regulatory ride due to new concerns on the side effect profile, the CML community was now curious to hear the new data on ponatinib presented at ASH 2014. Of special interest were updates on side effects and risk factors, and whether those trial participants who had to reduce their ponatinib doses were still responding well to the drug, but with better tolerability. An exciting and enriching "CML Horizons" Conference in Belgrade in May 2014. World CML Day on 22 September 2014 that demonstrated the unity of the global community with more than 30 worldwide activities. Publication of the International CML Book "Faces of Courage and Hope", published just in time for World CML Day 2014. Our inofficial Clinical Trial Registry that has significantly expanded over the past year. Currently the database lists 19 ongoing CML trials. Our CML Generics Declaration that a group of CML patient advocates agreed on in May 2014, complemented by a "knowledge base" on CML generics. Launch of a number of new educational videos for patients, aimed to highlight the subjects of "adherence", "side effects" and "testing and monitoring". Publication of a patient-friendly summary of the European LeukemiaNet recommendations (2013) for the management of Chronic Myeloid Leukemia. Publication of a summary of the patient advocacy sessions at the EHA congres in June 2014. Publication of two first reports of the ASH meeting in December 2014. Treatment-free remission, or stopping treatment in stable long-term deep molecular remission, has probably been the most reported topic at this year’s ASH. The European Stop Tyrosine Kinase Inhibitor study (EURO-SKI), being the largest ongoing STOP study, has just completed recruitment of 700 participants. An interim analysis of the first 200 patients from 8 European countries with a follow-up of minimum 12 months was now presented. The study aims to define prognostic markers to increase the rate of patients in durable deep molecular response after stopping TKI treatment, evaluation of molecular monitoring procedures, and the assessment of quality of life. 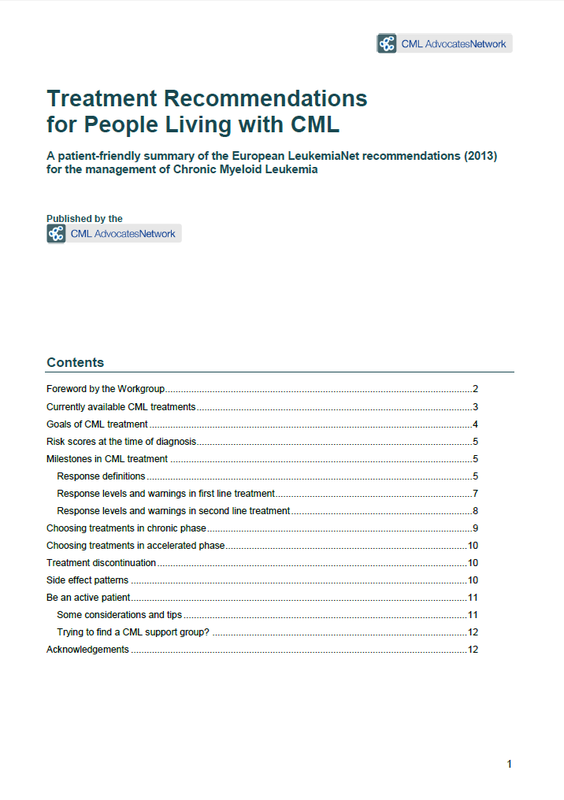 Now available: Our patient-friendly summary of the ELN CML Treatment Recommendations!